Today, New America’s Political Reform Program released the first in a series of papers from the New Models of Policy Change Project examining the “strange bedfellows” of transpartisan coalitions. 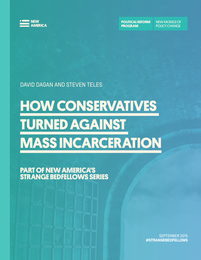 In “How Conservatives Turned Against Mass Incarceration” authors David Dagan and Steven Teles tell the previously untold history of how conservatives shifted views on criminal justice reform, how the state of Texas became a national leader, and the unlikely behind-the-scenes role played by left and liberal partners. The report tells the story of how a conservative shift played out, and the support it quietly drew from surprising liberal sources, even as each side maintained its own core principles. Liberals tend to view “mass incarceration” as a product of structural racism and crony capitalise, emphasizing the disadvantaged conditions of most offenders. Conservatives see the expansion of prisons as a case of big government run amok and stress the potential for offenders to be spiritually redeemed. These distinct narratives make prison reform a case of “transpartisanship”—agreement on policy goals driven by divergent, deeply held ideological beliefs—and a source of positive energy in a time of gridlock and widespread frustration with politics and governance. Over the next several months, New America’s New Models of Policy Change will release three more reports studying the successes, failures and key figures of this "transpartisan" approach to policy change.